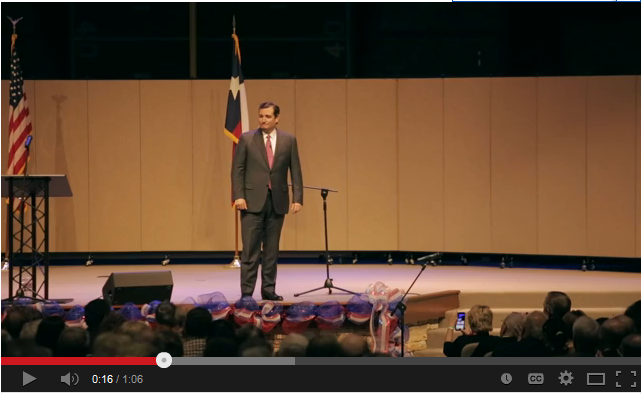 Ted Cruz needs an Attorney General here in Texas who has his back. If he’s fighting for our freedoms up in Washington, we can’t let him worry about whether or not his own Texas Attorney General will back him up in that fight.Friends, you can be sure that when elected your next Texas Attorney General, I will fight side by side with our Senator against the incredible overreach from Washington just like Greg Abbott has done. Conservatives across the state know I have a decade-long proven conservative record of fighting for our values. And now, these kind words from Sen. Cruz come just as we’ve won our 8th straw poll in this race for Texas Attorney General. (By the way, at the Denton County straw poll on Monday night we won with a solid 65% of the vote.) With your help, we will continue that streak all the way to election day on March 4th. If you are a fan of our Senator, then help me make sure he has a friend in the Attorney General’s office. Click here to go to our online action center and help send a proven conservative leader into the fight with Ted Cruz. Thank you for your interest in our campaign! I have met and spoken with Ken Paxton on several occasions. He seems to be a genuinely nice guy, but he has been in politics for over 12 years which makes him a “career politician”. Do we not have more than enough of those already? It is high time we disposed of the career politicians and elected business men to posotions of trust and authority. They know how to make government more cost efficent and effective, due to their business experience. I am in total agreement with you, and I am convinced that ‘term limits’ is the first step in a long journey back to the Constitution, but unfortunately, in the coming primary we are left with today’s reality. Our choices are limited. I am lukewarm, as well, Jack………..you and I have had the term limit and recall discussion several times. It seems to be too late to cleanse our body politic of its’ endemic corruption structure and payoff by lobbyists . All anyone has to see is our state rep and senator to know how valid that statement is. And it is widespread and embedded. Paxton is likely a nice person because he does support some conservative positions; however he has been mostly a career politician and they have trouble being completely straight on some issues. For example, I listened to the Ted Cruze clip three times and while he had nice things to say about Paxton NOT ONCE did he ever say I endorse Paxton. The banner on the Paxton blog is not telling the straight truth! This is the problem with long term politicians. They just can’t stick to the facts. Another thing that puts me off about career politicians especially, is the way they pour their wife and kids all over you. I don’t give a rat’s behind about their families. We all have families. What are his qualifications and what does he stand for? That is what I want to hear about. And even though I have attorneys as friends, I will no longer vote for one for public office. We have a preponderance of them in office now and look how well that is working for us.